Hello! — Telematic Café (TC) is greeting you and announcing the coming of its next event! 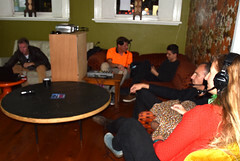 The inaugural appearance of TC as part of Telematic Embrace – Café that took place at George Paton Gallery (University of Melbourne Union House, May 2015) – the venue famous for its radical approaches to art in Australia in the 1970s and 80s – established TC as an archaeological and reflective project seeking meanings of technology-based mediation in post-digital conditions. It is the wider motivation of TC to revisit and refresh avant-garde visions in the time of digital culture. The next edition of Telematic Café is making its way to you by continuing explorations into old and new technologies. Its key guidelines are: to create transformative, transient and temporary “telematic communication models,” – this may take various forms including distributed spatial constructs by means of telecommunication networks but should ultimately focus on awareness and creative thinking about the Medium of our expanded connections and experiences. The TC project is not programmatic, but rather discursive, and curious to ask a question – what can be learnt by the possibilities of the post-digital aesthetics of representation within the meta-space of networks (the data extracted from these networks) but also – the avant-gardist tradition of instigating, within an experimental art process, alternative real-time systems for communication, or even relationships? A platform of testing and “tasting” of what’s on Menu, TC occupies the field of art where it matters how it operates here and now: TC functions as an interactive environment in social, collective, possibly – collaborative contexts. 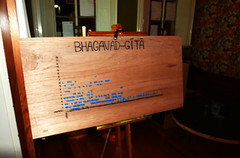 Posted in Avant-garde, Communication, New Events, Telematic Communication Models. “Disclosure and analysis require human transaction, the transfer of feelings, thoughts, and information from one to another. Reciprocity generates trust and sympathy. This is particularly appropriate when we are concerned with disclosure of the inner self, as in art. The table-top enables us to float out our intangible dreams and intimations on a secure and substantial surface.” – p 172, “Table”, Roy Ascott, 1975. Is love in the Telematic Embrace only transient? Do today’s platforms of distributed authorship truly permit a chance to dream? 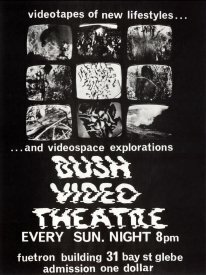 The hippie video collective Bush Video – pioneers of democratic media in Australia – are best known for their seminal project at the student festival in Nimbin (1973). 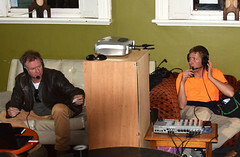 They gave out cameras to festival participants and laid a cable network for community broadcasting. The contributed material was shown on multiple monitors around the festival. Back in Sydney, these were used in the studio which was the home for a ‘collaborative anarchy’ centered around experimentation with electronic video. Read the full story of Bush Video documented by Stephen Jones here. Quotation from article ‘Bush Video Tharunka (August 1973)’ – http://scanlines.net/object/bush-video-tharunka on Scanlines: Media Art in Australia since the 1960s (scanlines.net). Quotation from article ‘Bush Video’ by Stephen Jones – http://scanlines.net/person/bush-video on Scanlines: Media Art in Australia since the 1960, scanlines.net. Posted in Avant-garde, Democratic media. Imagine being in two places at once… In quite different moments of techno-culture, these art projects – 30 years apart – interpret and challenge the same thing – link between two different cities to extend and transcend communication in public space. A play in the networked space on the intersection of reality and illusion. 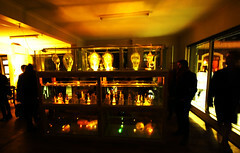 For more info go to Turbulence/ Networked_Performance blog here. For more info go to Occupy the Screen site here. Posted in Avant-garde, Communication, Telepresence.